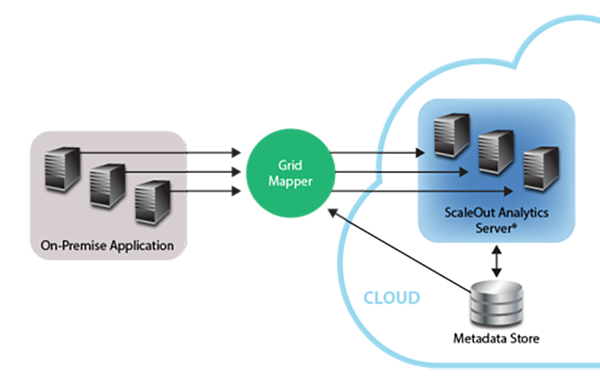 Cloud-based applications enjoy the unique elasticity that cloud infrastructures provide. As more computing resources are needed to handle a growing workload, virtual servers (also called cloud “instances”) can be added to take up the slack. For example, consider a web server farm handling requests for web users or mobile apps. Being able to add computing resources on demand keeps work queues small and ensures that web users always see fast response times. And after a period of peak demand subsides, resources can be dialed back to minimize cost without compromising quality of service. Flexible pricing options on some public clouds ranging from hourly to annual charges per instance give organizations the ability to cost-effectively outsource hosting for their production applications. In-memory data grids (IMDGs) add tremendous value to this scenario by providing a sharable, in-memory repository for an application’s fast-changing state information, such as shopping carts, financial transactions, pending orders, geolocation information, machine state, etc. This information tends to be rapidly updated and often needs to be shared across all application servers. For example, when external requests from a web user are directed to different web servers, the user’s state has to be tracked independent of which server is handling the request. With their tightly integrated client-side caching, IMDGs typically provide much faster access to this shared data than backing stores, such as blob stores, database servers, and NoSQL stores. They also offer a powerful computing platform for analyzing live data as it changes and generating immediate feedback or “operational intelligence;” for example, see this blog post describing the use of real-time analytics in a retail application. A key challenge in using an IMDG as part of a cloud-hosted application is to easily deploy, access, and manage the IMDG. To meet the needs of an elastic application, an IMDG must be designed to transparently scale its throughput by adding virtual servers and then automatically rebalance its in-memory storage to keep the workload evenly distributed. Likewise, it must be easy to remove IMDG servers when the workload decreases and creates excess capacity. Like the applications they serve, IMDGs are deployed as a cluster of cloud-hosted virtual servers that scales as the workload demands. This scaling may differ from the application in the number of virtual servers required to handle the workload. To keep it simple, a cloud-hosted application should just view the IMDG as an abstract entity and not be concerned with individual IMDG servers or the data they hold. The application does not want to be concerned with connecting N application instances to M IMDG servers, especially when N and M (as well as cloud IP addresses) vary over time. Even though an IMDG comprises several servers, the simplest way to deploy and manage an IMDG in the cloud is to identify it as a single, coherent service. ScaleOut StateServer® (and ScaleOut Analytics Server®, which includes features for operational intelligence) take this approach by naming a cloud-hosted IMDG with a single “store” name combined with access credentials. This name becomes the basis both for managing the deployed servers and for connecting applications to the IMDG. When the IMDG’s servers start up, they make use of metadata to find and connect to each other and to form a single, scalable, peer-to-peer service. 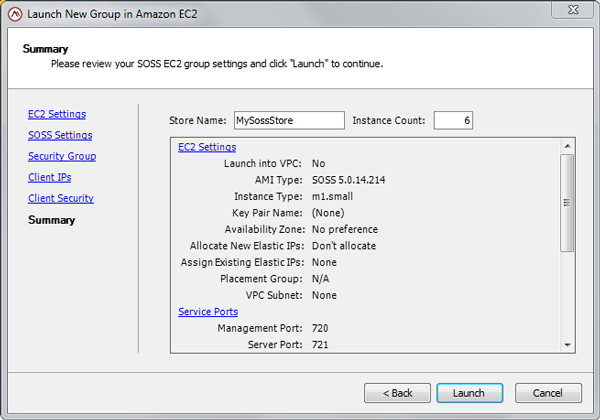 ScaleOut StateServer uses different techniques on EC2 and Azure to make use of available metadata support. Also, the ScaleOut management console lets users specify various security parameters appropriate to the various cloud providers (e.g., security groups and VPC in EC2 and firewall settings in Azure), and the start-up process configures these parameters for all IMDG servers. The management console also lets users add (or remove) instances as necessary to handle changes in the workload. The IMDG automatically redistributes the workload across the servers as the membership changes. The power of managing an IMDG using a single store name becomes apparent when connecting instances of a cloud-based application to the IMDG. On-premise applications typically connect each client instance to an IMDG using a list of IP addresses corresponding to available IMDG servers. This process works well on premise because IP addresses typically are well known and static. However, it is impractical in the cloud since IP addresses change with each deployment or reboot of an IMDG server. The solution to this problem is to let the application access the IMDG solely by its store name and cloud access credentials and have the IMDG find the servers. The store name and credentials are stored in a configuration file on each application instance with the access credentials fully encrypted. At startup time, the IMDG’s client library reads the configuration file and then uses previously stored metadata in the cloud to find the IMDG’s servers and connect to them. Note that this technique works well with both unencrypted and encrypted connections. As more and more server-side applications migrate to the cloud to take advantage of its elasticity, the power of IMDGs to unlock scalable performance and operational intelligence becomes increasingly compelling. Keeping IMDG deployment as simple as possible is critical to unlock the potential of this combined solution. 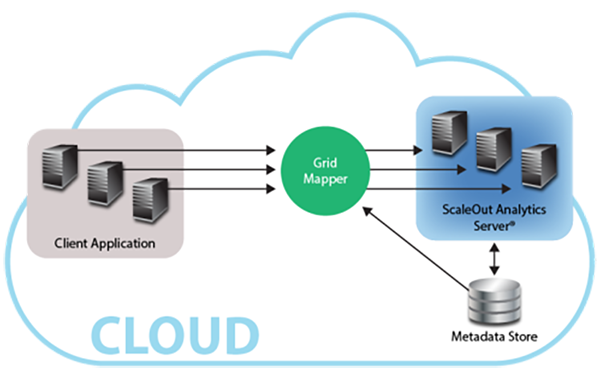 Leveraging cloud-based metadata to automate the configuration process lets the application ignore the details of the IMDG’s infrastructure and easily access its scalable storage and computing power.